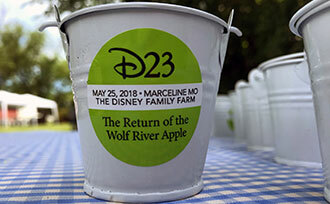 On May 25, 2018 we found some Disney magic in the small town of Marceline, MO, when we planted 11 Wolf River apple trees at Walt Disney’s childhood home. “Where Dreams Come True” is a famous slogan usually associated with Disneyland and Disneyworld, but on Friday, some Disney magic held court in the small town of Marceline, MO, where Stark Bro’s Nurseries & Orchards Co. replaced 11 Wolf River apple trees at Walt’s childhood home. In the very early 1900s, Wolf River trees grew in the orchard on the Disney farm in Marceline. Walt loved the pies his mother would make with only one or two of the apples — the fruits can weigh up to a pound apiece. 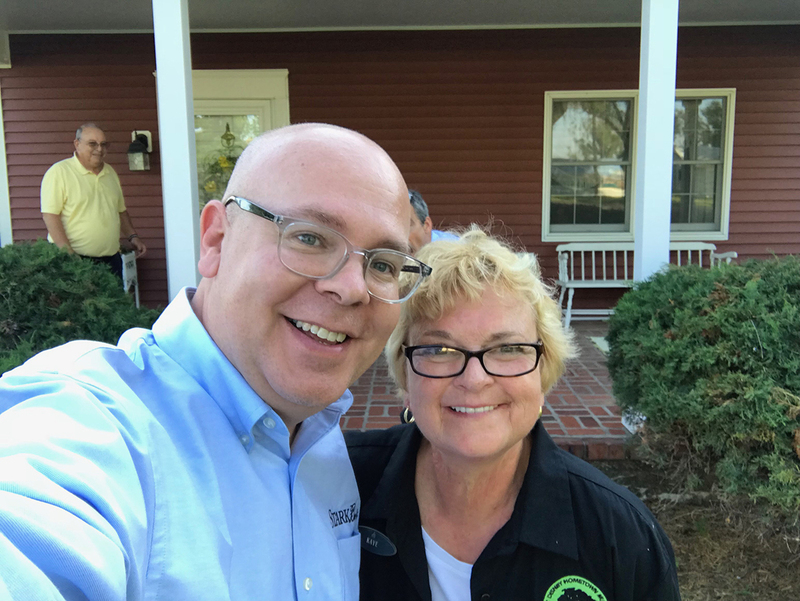 The trees were long gone until Matt Bollinger, IT Manager for Stark Bro’s (and a diehard Disney fan), struck up a friendship with Kaye Malins, Executive Director of the Walt Disney Hometown Museum. Matt and Kaye discussed the idea of restoring Walt’s favorite apple trees to the orchard, and soon, a plan was hatched to have Stark Bro’s donate and plant the trees as part of a special “Return to Marceline” event on May 25, which treated 100 Disney fan club members to a special day of learning about the impact this bucolic setting had on Walt’s boyhood days and future successes. Matt Bollinger, Stark Bro’s IT Manager (left) with Kaye Malins, Executive Director of the Walt Disney Hometown Museum. Matt and Kaye are standing in front of Walt Disney’s childhood home, where Kaye resides. 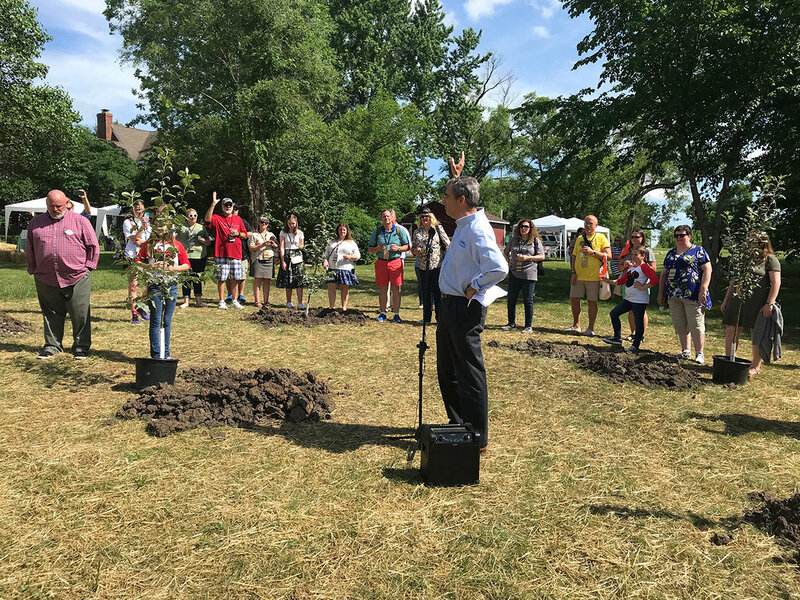 The formal tree planting was a special surprise for the fans. Senior Disney staff actually brought soil from the Disney studios in California, and parsed it out into small souvenir pails for the fan club members. 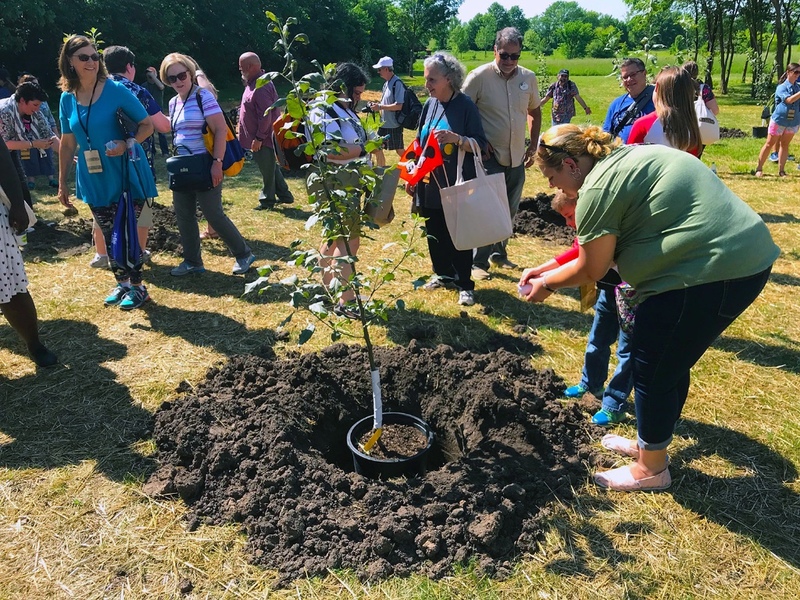 Each member contributed their “Disney Dirt” to the tree holes, a symbolic and meaningful gesture that clearly had an emotional impact on the group. Disney fan club members contribute soil from the Disney studios to the planting hole on the Disney Family Farm in Missouri. Stark Bro’s Chief Marketing Officer Ken Lane explains the history of the Wolf River apple during the “Return to Marceline” event at the Disney Family Farm. The event was broadcast on Facebook Live. The videos can be viewed in the Videos section of our Facebook page. Not many people know about Disney’s connection to Missouri. The Disney Farm is where the famous “Dreaming Tree” used to grow. It was a large cottonwood (that perished in 2015) under which Walt spent many hours observing nature and letting his imagination run free. The inspiration he drew from these introspective moments eventually influenced the creation of Mickey Mouse, among other Disney favorites, such as “Silly Symphony”. The barn, which was recently rebuilt, is where Walt spent hours sketching out cartoon characters and storyboards. It was a very formative place for him, and its impact permeated his lifetime of work. The Wolf River apple trees are expected to bear fruit in three to four years, and will help to support the Walt Disney Hometown Museum. In the coming years, the apples should ripen around the time of Marceline’s annual “Toonfest” event. 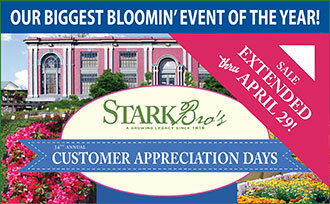 Garden Center: Customer Appreciation Days 2019 For the 35th time, Stark Bro's Nurseries & Orchards Co. will hold its annual Garden Center event, drawing customers from around the country. 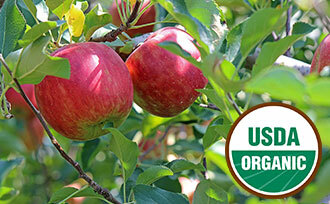 Stark Bro’s re-introduces organic fruit trees — this time, with USDA certification More than 200 years ago, Stark Bro's Nurseries & Orchards Co. grew organic fruit trees because there was no other way. 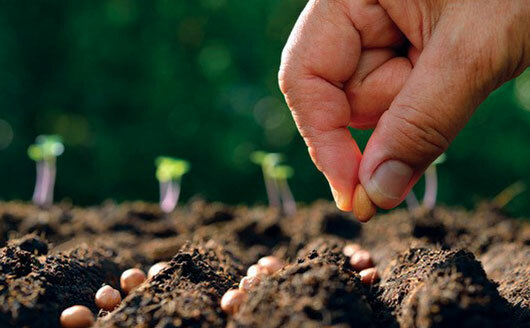 Now the Louisiana, MO-based company has come full circle, and is "re-introducing" organic trees to its national customer base. This time, the trees are USDA-certified and 100% non-GMO, something company founder James Hart Stark couldn’t possibly have imagined. 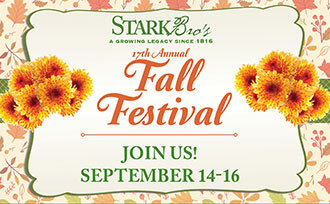 Garden Center Fall Festival 2018 2018: Stark Bro's Garden Center hosts its annual Fall Festival from September 14-16. This free event includes cider-making demos, pumpkin painting and more! 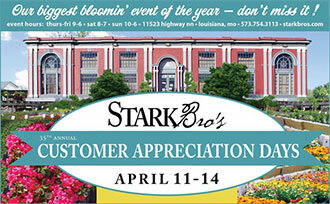 Garden Center: 2018 Customer Appreciation Days Extended For the 34th time, Stark Bro’s Nurseries & Orchards Co. will hold its annual Garden Center event, drawing customers from around the country.